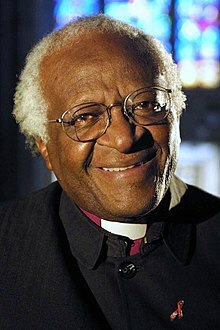 Desmond Mpilo Tutu (born October 7, 1931) is a South African social rights activist and retired Anglican bishop who rose to worldwide fame during the 1980s as an opponent of apartheid. 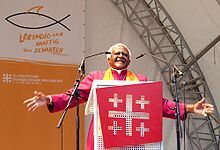 He was the first black Archbishop of Cape Town and bishop of the Church of the Province of Southern Africa (now the Anglican Church of Southern Africa). He was awarded the Nobel Peace Prize in 1984. If it happened in South Africa, why can't it happen anywhere? [T]here is always the possibility of change. If it happened in South Africa, why can't it happen anywhere? This family has no outsiders. Everyone is an insider. When Jesus said, "I, if I am lifted up, will draw..." Did he say, "I will draw some"? "I will draw some, and tough luck for the others"? He said, "I, if I be lifted up, will draw all." All! All! All! – Black, white, yellow; rich, poor; clever, not so clever; beautiful, not so beautiful. All! All! It is radical. All! Saddam Hussein, Osama bin Laden, Bush – all! All! All are to be held in this incredible embrace. Gay, lesbian, so-called "straight;" all! All! All are to be held in the incredible embrace of the love that won’t let us go. As quoted in God’s Mission in the World : An Ecumenical Christian Study Guide on Global Poverty and the Millennium Development Goals (2006) by The Episcopal Church Office of Government Relations and the Evangelical Lutheran Church in America. Whether Jews like it or not, they are a peculiar people. They can't ever hope to be judged by the same standards which are used for other people. God deliberately did not make the world perfect, for God is looking for you and me to be fellow workers with God. Sometimes you want to whisper in God's ear, "God, we know you are in charge, but why don't you make it slightly more obvious?" Life is more exhilarating as you try to work out the implications of your faith rather than living by rote, with ready-made second-hand answers, fitting an unchanging paradigm to a shifting, changing, perplexing, and yet fascinating world. Some of my friends are skeptical when they hear me say this, but I am by nature a person who dislikes confrontation. I have consciously sought during my lifetime to emulate my mother, whom our family knew as a gentle “comforter of the afflicted.” However, when I see innocent people suffering, pushed around by the rich and the powerful, then, as the prophet Jeremiah, says, if I try to keep quiet is is as if the word of God burned like a fire in my breast. I feel compelled to speak out, sometimes to even argue with God over how a loving creator can allow this to happen. In the Church of Sant'Egido in Rome, home of an extraordinary community of lay people devoted to working with the poor, there is an old crucifix that portrays Christ without arms. When I asked about its importance to the community, I was told that it shows how God relies on us to do God's work in the world. Without us, God has no eyes, without us, God has no ears; without us, God has no arms or hands. God relies on us. Won't you join other people of faith in becoming God's partners in the world? Isn’t it noteworthy in the parable of the Good Samaritan that Jesus does not give a straightforward answer to the question "Who is my neighbor?" (Luke 10:29). Surely he could have provided a catalog of those whom the scribe could love as himself as the law required. He does not. Instead, he tells a story. It is as if Jesus wanted among other things to point out that life is a bit more complex; it has too many ambivalences and ambiguities to allow always for a straightforward and simplistic answer. This is a great mercy, because in times such as our own — times of change when many familiar landmarks have shifted or disappeared — people are bewildered; they hanker after unambiguous, straightforward answers. We appear to be scared of diversity in ethnicities, in religious faiths, in political and ideological points of view. We have an impatience with anything and anyone that suggests there might just be another perspective, another way of looking at the same thing, another answer worth exploring. There is a nostalgia for the security in the womb of a safe sameness, and so we shut out the stranger and the alien; we look for security in those who can provide answers that must be unassailable because no one is permitted to dissent, to question. There is a longing for the homogeneous and an allergy against the different, the other. Now Jesus seems to say to the scribe, "Hey, life is more exhilarating as you try to work out the implications of your faith rather than living by rote, with ready-made second-hand answers, fitting an unchanging paradigm to a shifting, changing, perplexing, and yet fascinating world." Our faith, our knowledge that God is in charge, must make us ready to take risks, to be venturesome and innovative; yes, to dare to walk where angels might fear to tread. When people say that the Bible and politics don't mix, I ask them which Bible they are reading. This quote, often attributed to Jomo Kenyatta, was first written in a fiction play published by holocaust doubter Rolf Hochhuth, in his controversial The Deputy, a Christian tragedy (1964), Grove Press, p. 144. No reference to any historical or original source was given. Other citations are found in books written by critics of religion, such as Christos Tzanetakos's "The Life and Work of an Atheist Pioneer", iUniverse; and Jack Huberman's "Quotable Atheist: Ammunition for Nonbelievers, Political Junkies, Gadflies, and Those Generally Hell-Bound" (2008), 175. No references are given. In Desmond Tutu: A Biography (2004) by Steven Gish, p. 101; is clarified Tutu used it as a joke which was not of him. If the reasons for Desmond Tutu becoming one of the world's most prominent advocates of faith-based social justice and religious tolerance could be reduced to a single succinct statement, it would be this: his fierce and uncompromising determination to tell the truth as he sees it. Nothing epitomizes Desmond Tutu's radicalism (using the word radical, as he likes to say, in the original sense of getting to the root of an issue) more than his views on the relationship of his faith to the faith of others.